February 10 is the 41st day of the year in the Gregorian calendar.There are 324 days remaining until the end of the year(325 in leap years). 1940 – Tom and Jerry make their debut with Puss Gets the Boot . 1962 – Roy Lichtenstein's first solo exhibition opened, and it included Look Mickey , which featured his first employment of Ben-Day dots, speech balloons and comic imagery sourcing, all of which he is now known for. Year 1258 (MCCLVIII) was a common year starting on Tuesday of the Julian calendar. Mongol invasions and conquests took place throughout the 13th century, resulting in the vast Mongol Empire, which by 1300 covered much of Asia and Eastern Europe. 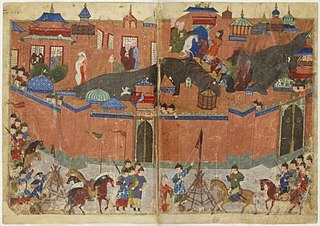 Historians regard the destruction under the Mongol Empire as results of some of the deadliest conflicts in human history. In addition, Mongol expeditions may have brought the bubonic plague along with them, spreading it across much of Asia and Europe and helping cause massive loss of life in the Black Death of the 14th century. George of the Palatinate was Bishop of Speyer from 1513 to 1529. Scholastica is a saint of the Roman Catholic Church and the Eastern Orthodox Churches. She is honored in the Episcopal Church's calendar of saints. She was born in Italy. According to a ninth century tradition, she was the twin sister of Benedict of Nursia. Her feast day is 10 February. Austrebertha was a French nun of the Middle Ages, who took the veil very young and was a nun at the Port Monastery in the Ponthieu. Then she became abbess to the foundation of Pavilly, where she died at the beginning of the eighth century, at the age of 74 years. She is venerated as a saint by the Catholic Church. Her feast day is February 10. Saint José Luis Sánchez del Río was a Mexican Cristero who was put to death by government officials because he refused to renounce his Catholic faith. His death was seen as a largely political venture on the part of government officials in their attempt to stamp out dissent and crush religious freedom in the area. He was dubbed "Joselito". Wikimedia Commons has media related to February 10 .